SP101 And GP100 Ruger - The Truth You Should Know! →GP100 vs. SP101 – The Truth You Should Know! GP100 vs. SP101 – The Truth You Should Know! Which kind of pistols is the best to carry for defense purpose? It is also a big question in the community. Now this article below will give you the best solution with experts’ advice. 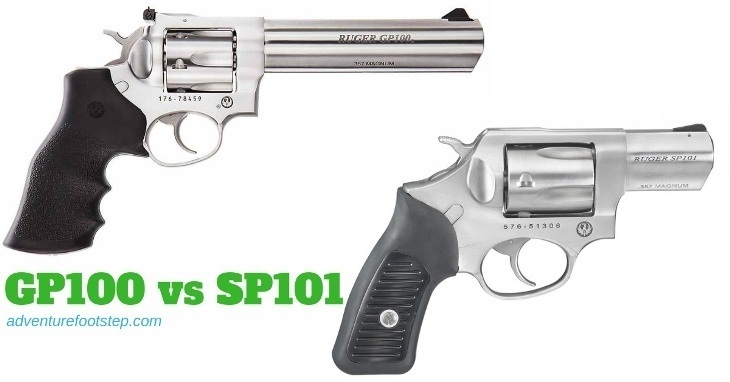 Today I will share with you the good and bad things about GP100 and SP101 ruger as we will compare both of them. Let’s get started! What are GP100 and SP101? The GP100 vs SP101: Which is Better For Personal Protection? It is a modernized version of the Security Six. According to experts in this field, the newer model is firing better and cleaner. That is the reason why many people or citizens like to keep it at their waist in everyday situations. This revolver is a full-size pistol, so it is large enough to handle .357 Magnum but also small enough for you to carry and hide it. The GP100 weighs 1 kilogram, and it very popular with a few law enforcement departments in the world because of its versatility. This gun has a broad range of barrel lengths and caliber fittings, and it can get five, six, seven, or even ten shots. The standard models of GP100 have a 4.2- inch barrel with full shroud. This gun holds 6 of .357 Magnum, designed to shoot from the ground up. Most standard models are blued steel, but some of them come with stainless steel. Some variants of GP100 consist of a couple that hold 7 of .327 Federal, a few that hold 5 of 44 Special, etc. The standard barrel length is 4.2 inches, but some models are 2.5 inches or 5.5 inches. Moreover, this pistol also has fiber optic sights, along with the read sight and front blade. The GP100 has poor aftermarket support and add-ons. The SP101 has been very famous as the best compact .357 Magnum handguns to carry. It brings us the feeling and function of classic hidden carry pistols. This gun can contain five, six, or eight shots, depending on barrel lengths. This one has three barrel lengths: 2.25 inches, 3 inches and a pair models of 4.2 inches. Most models is made of stainless steel, and they have front blade sight, and a rear trench cut into the top strap. Besides, a few models consist of a target rear sight and a fiber optic front. Most models consists of 5-inch of .357 Magnum, and one or two of .38 Special +P, and one of 9mm. The SP101 operates like a high-performance weapon because it is sturdy and easy to aim and shoot. Besides, it is tough to detect before you draw it. This revolver is lighter than the GP100 as it weighs 0.74 kilograms. Its tall is 4.5 inches with the standard rubber grips, and its width is 1.4 inches at the cylinder. Besides, the SP101’s lengths are 7.2 inches with the 2.25-inch barrel and 8 inches with the 3-inch barrel. The more heavy its weight and the bigger grip is, the easier shooting .357 Magnum is for you. This one has a sharp recoil, so you have to take a moment to steady yourself before shooting. We usually catch these action in movies when the actor or actress runs, draws and fires at the same time. It is not true with SP101 in this situation. If you care about the price of two types of these guns, please check this link here: Ruger SP101 vs. Ruger GP100. The sight tracking is better during rapid fire. The capacity and variety of calibers are also a big plus for this gun. We have gotten clear proof that the GP100 has improved in recent years. It has a smooth double action and bobbed hammer, making shooting so fun and painless. This handheld revolvers is better than GP100 at aftermarket support and add-ons. After comparison, the GP100 is evaluated as the better pistol for personal protection and concealed carry. This gun marks an improvement of previous handheld revolvers because it has been good enough about the fit of barrel lengths and caliber. As you know, the GP100 is more versatile and suitable for your tastes.The loading and shooting process of this handgun is very smooth. As you know, SP101 is a small size revolver, and police departments have used it as a quick backup weapon. In short, two of them are great revolvers. However, according to me, the best gun is a handgun that is easy to use in an emergency. For example, when a bad guy or robber attacks you, you have to react fast. That also depends on your gun you are carrying. The GP100 is easier to handle and to shoot than the SP101. Both of them have many versions with different barrel lengths, caliber size to fit your needs. Which features do you like about the SP101?It has a smooth double action with the bobbed hammer, wide and high visibility sights. It is also much lighter than the GP100. Which features do you like about GP100? During rapid fires, it is easier for you to track the sights than the SP101 because you can adjust the mode of views. GP100 is also variety of calibers and the shot capacity. Both the SP101 and the GP100 are great handheld revolvers with small size for concealed carrying purpose to protect yourself. Which one do want to keep by your side, it’s up to your personal preferences and your shooting skills. Both of them can get the job well! If you enjoy this article, please like and share it. Let‘s discuss and give comments below!